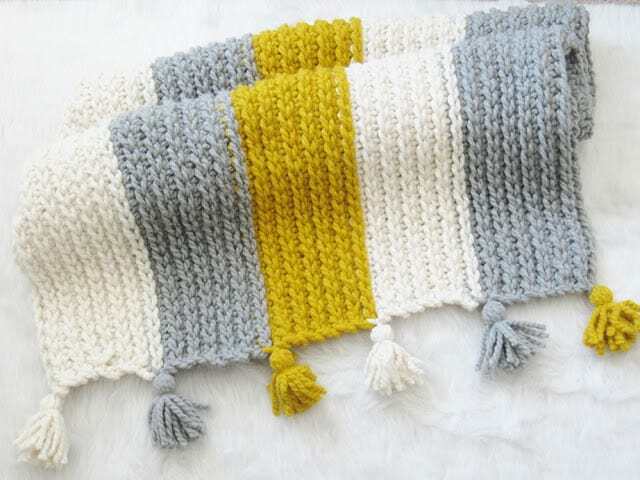 This crochet afghan pattern was inspired by the arm knitting video that has been doing the rounds on the internet. I wanted to recreate the knit look without the hassle of finger crocheting. So I used a chunky yarn and a jumbo hook to design this knit-look crochet afghan. You can work from the free pattern below or purchase an Ad-free pdf for $1.99 here. I was able to work this pattern up in less than 6 hours. The result was a warm and squishy blanket in which you would want to curl up all day long. Every second row of the pattern is worked into slip stitches to give that knit effect. Do you slip stitch tight? I know most people do. So I have provided a video that will tell you how to slip stitch loosely. The tip isn’t rocket science but something people tend to overlook. So if it looks silly to you, I apologize in advance but hey, it works :). So without further ado, let us get to the pattern. 1. Chunky Size 6 yarn. I used Lion Brand Wool-Ease in color Fisherman and Big Twist Natural Blend in colors Aged Brass and Light Gray. 2. Hook Q – 15.75mm. It is a jumbo hook. 35 inches X 27 inches. 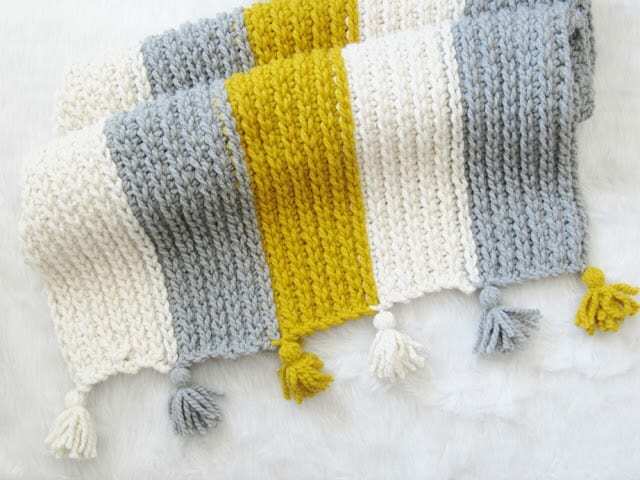 You can add more to the width of the blanket by adding more stripes. If you want to add to the length, you will have to add to more chains to your foundation chain. Any number of chains will work as there are no pattern repeats. Each Stripe took me 1 skein of chunky yarn (98 yards each) with a little left over to make tassels. 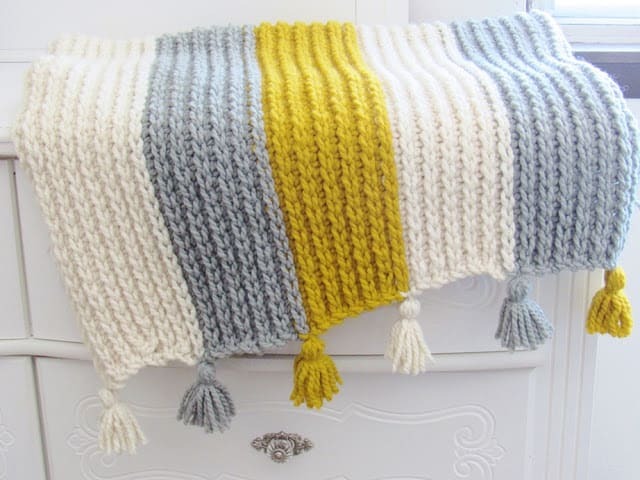 If you plan to make it wider you will add one skein for each stripe. I had 5 stripes and used 5 skeins of 98 yards each. Each stripe will add 5 inches to the width. Note: Make the slip stitches of each row loosely or you will find it hard to work the following row. 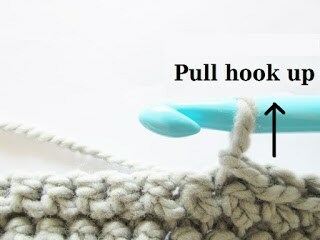 To make it loose, pull up the loop on your hook before working the slip st. You can see a video below. Note: The next row is worked into the sl stitches that will be stuck behind your work. Lift the sl st with your fingers and then stick your hook into it. This will make it easier to work into them. Repeat Rows 2 and 3 until you have 6 sc rows, change colors while completing the last sc st of the row. To join the new color, pull the new color yarn through when you have 2 loops on your hook. You can see a video on changing colors here. Repeat Rows 2 and 3 until you have 6 sc rows for each stripe and then switch to the next color. 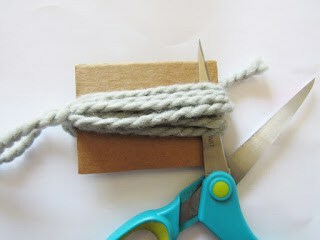 Take a piece of cardboard 3 1/4 inch long and wrap the chunky yarn around it 12 times. 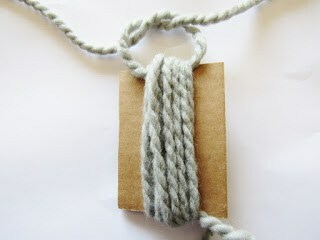 Pull a 14-inch strand of yarn through the winding and knot twice at the top. Take another 12-inch strand and make a knot a little below the top knot. Trim the excess from the strand you just tied but leave the top 2 strands for attaching to the afghan. I added one tassel at each color change. You can add more if you want. I added tassels in all the colors of the stripes. You can choose to make it in one single color if you want. 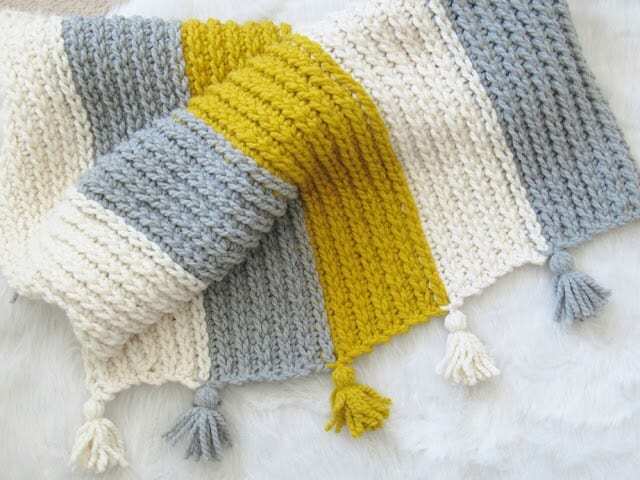 Use the two tails left on top to tie the tassel onto the blanket. 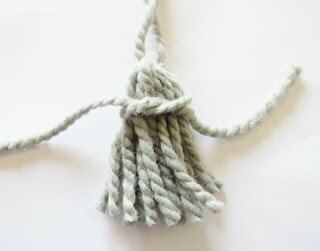 Pull the remaining tails through the tassel using a smaller hook. Trim to make them blend with the rest of the tassel. 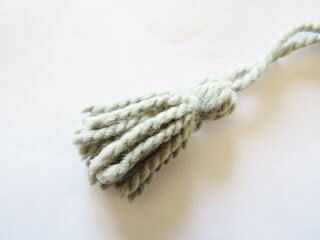 Use the smaller hook to weave in any tails left. You might also like my Sun Room Afghan found here. Check out my full collection of crochet patterns here: Pattern Gallery. You can find more such afghans featured on Allfreecorchetafghans.com. I've spent hours and hours trying to make a blanket using this and cannot figure out what I'm doing wrong and why it's slanting. Is there a video somewhere that shows the whole thing with turning rows? I am sorry, I do not have a video. You could be losing stitches as you are not working into the turning chains. Try placing a marker in the first and last stitches of the rows. First try it with a small swatch so you don't have to unravel all your work. You can chain any number to start. Why do you offer free patterns then make it impossible to print them. There is no way to print this pattern and still be able to read it. Hi Becky, there is a link included to purchase an Ad-free PDF version for $1.99. It is right under the pictures of the finished blanket.